Introducing the KSB K2 EC industrial noise-insulated fan – a new arrival from VENTS! Designed for supply and exhaust ventilation systems the KSB K2 EC fan has a much higher air performance than most other models in the series. Thanks to the low-energy EC motor the maximum air performance reaches 7,145 m3/h. The fan management has also been upgraded with a host of smart functions. The unit speed changes automatically depending on the temperature, humidity and pressure in the serviced space or when the carbon dioxide or smoke concentrations reach a critical level. Several fans can be integrated into a single network. The operation of all the fans on the network is conveniently programmed via a PC – moreover, each fan can be individually set up for maximum efficiency. The fan designers made sure to keep the fan installation and operation as simple as possible. First and foremost, they made the fan very compact. The KSB K2 EC will perfectly suit spaces with limited installation space. The unit position only depends on the air flow direction without any other limitations. The top lid of the casing is secured with an easy-access latch to provide easy access to the internal components of the fan. The casing has an internal heat and sound insulation layer made of non-combustible mineral wool. There is an extra layer of perforated sheet steel inside the casing for even better sound absorption. 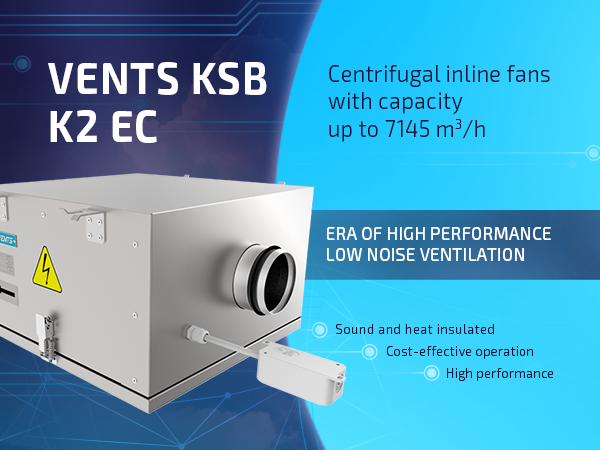 The KSB K2 EC fan offers outstanding performance and quiet operation which coupled with an extremely compact footprint results in an excellent ventilation solution for a wide variety of applications.